Today the pieces of Mary batik fabrics get put back together to make a bold center block for the quilted cushion cover. In yesterday’s post, I listed the cutting directions and featured photos of all the main fabrics. There are other colorways too – green, red, and teal. I’ve used the rust and pink! Can you spy the churn dashes in this cushion? 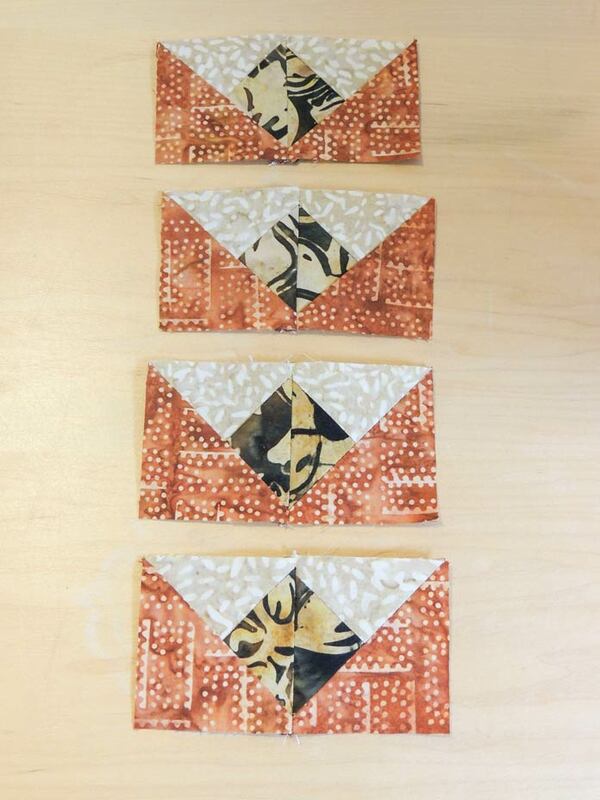 I challenged myself to use the bold batik prints to create a secondary design out of them. Follow along and create your own dashing cushion cover. 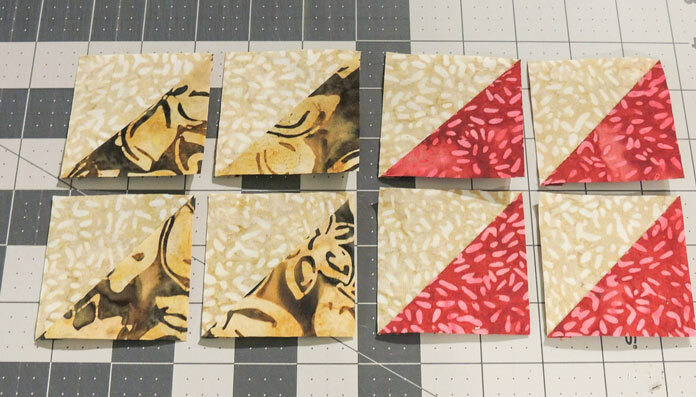 Use the Fabric B – 3″ squares to make HSTs. Pair 2 with Fabric A squares and 2 with Fabric E squares. Draw one diagonal line on the back of EACH Fabric B – 3″ square. With Right Sides Together, sew one Fabric B – 3″ square to one Fabric A – 3″ square sewing ¼” away on each side of drawn line. Cut on the drawn line to create 2 HSTs; press the seams to the darker fabric. Trim each HST to 2½” square. Repeat to make a second set of Fabric A/B HSTs. 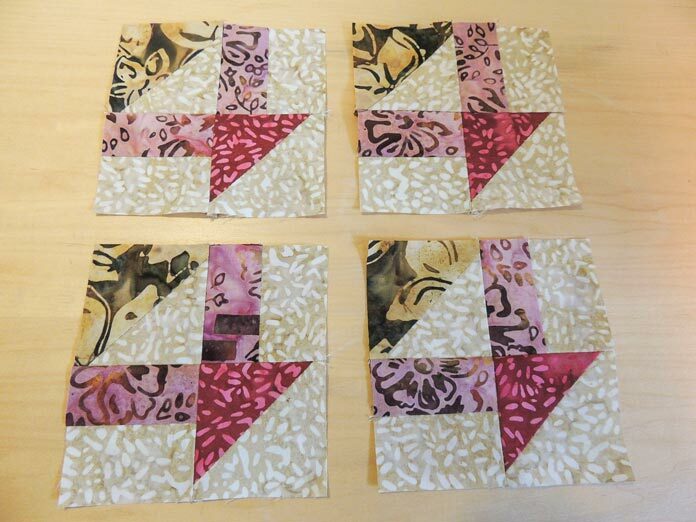 Repeat two more times with the two Fabric E – 3″ squares and the two remaining Fabric B – 3″ squares. You should have 4 Fabric A/B HSTs and 4 Fabric B/E HSTs. Make border units by sewing one Fabric B rectangle along a long edge of a Fabric C rectangle; press the seam to the Fabric quarter triangles side. Unit should measure 2½” square. Repeat to make 8 total units. Arrange HSTs and border units as pictured. Sew HST to border unit in each row, pressing the seams to the HST. Join the two rows to complete the border unit. The joining seam will need to be pressed in different directions depending on the block’s location in the final assembly. You could choose to wait and do the pressing once your blocks are laid out. The unit should measure 4½” square. Repeat to make 3 more blocks. Sew a Fabric B quarter triangle along one short edge to the LEFT of the short edge of one Fabric A quarter triangle; press the seam to the darker fabric. Sew a Fabric D half triangle along the bottom edge of the Fabric A/B half triangle; press the seam to the Fabric D half. Unit should measure 2½” square. Repeat to make 3 more identical units. Sew a Fabric B quarter triangle along one short edge to the RIGHT of the short edge of one Fabric A quarter triangle; press the seam to the darker fabric. Sew a Fabric D half triangle along the bottom edge of the Fabric A/B half triangle; press the seam to the Fabric D half. 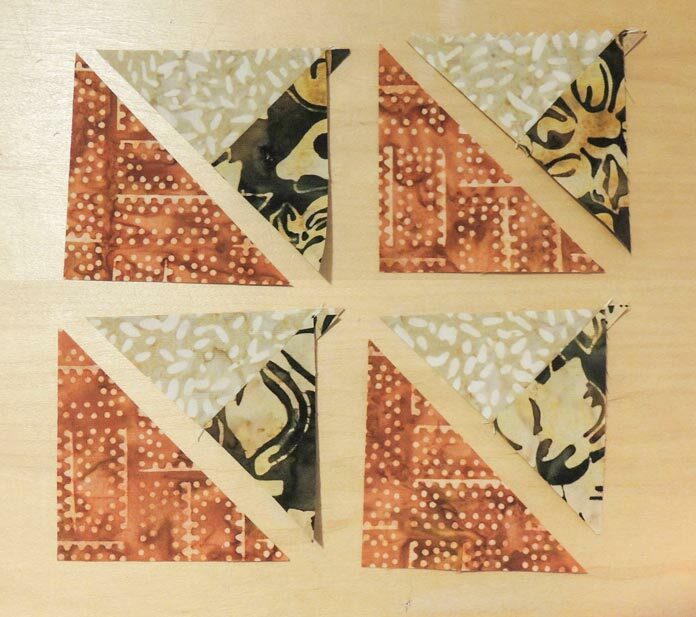 Using the photo below for orientation, sew one of each of the quarter triangle/HST units together, sewing the Fabric A quarter triangle sides together. Unit should measure 2½” high x 4½” wide. Repeat to make 3 more middle blocks. Make inner rectangle units by sewing one Fabric D rectangle to Fabric A square. Sew a second Fabric D rectangle to the opposite side of the Fabric A square. Press both seams to the inner square. Each R/S/R unit should measure 2½” high x 4½” wide. Repeat to make 3 more units. Sew one on the triangle units to the top of one of the R/S/R units. Press the seam to the R/S/R unit. Repeat to make 4 middle blocks. Two units to create middle block unit. 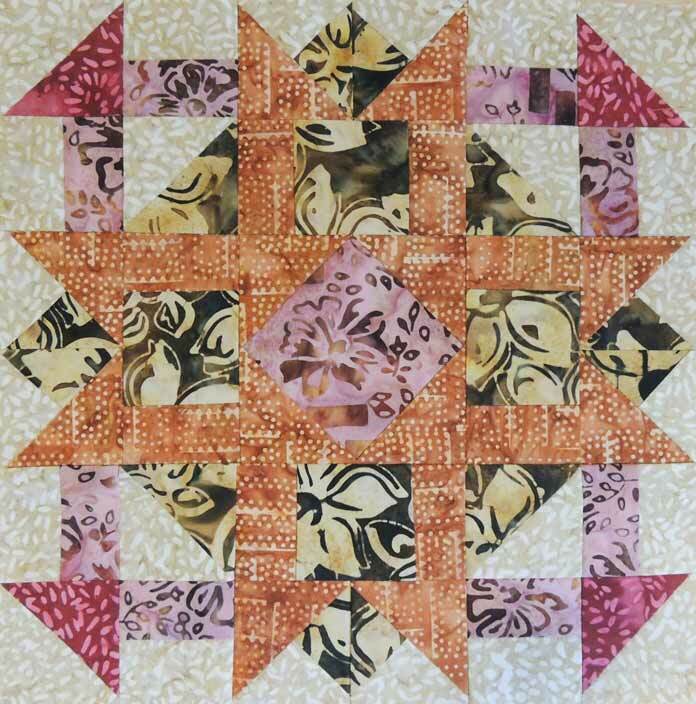 Make center square in a square unit using Fabric C – 4½” square and four Fabric D– 2½” squares. Place one Fabric D – 2½” square right side down on a corner of Fabric C square and sew a diagonal line opposite the outside corner. TIP Sew your line just a wee little bit to the left of the line, the side you will not be cutting off. Repeat on opposite corner. Trim ¼” seam and press to the new triangle corners. Repeat with the two remaining Fabric D – 2½” squares. Completed Center Square in a Square measures 4½”. Sew the blocks into rows, following the photos for correct orientation of the units. Don’t press the seams until the full row is sewn, then press the first-row seam to the left, the middle to the right, and the bottom row to the left again. Pin and sew rows together, pressing the final seams away from the middle row. The block should measure 12½” square. Block units sewn into rows. The center block is complete. Can you see the churn dashes now? 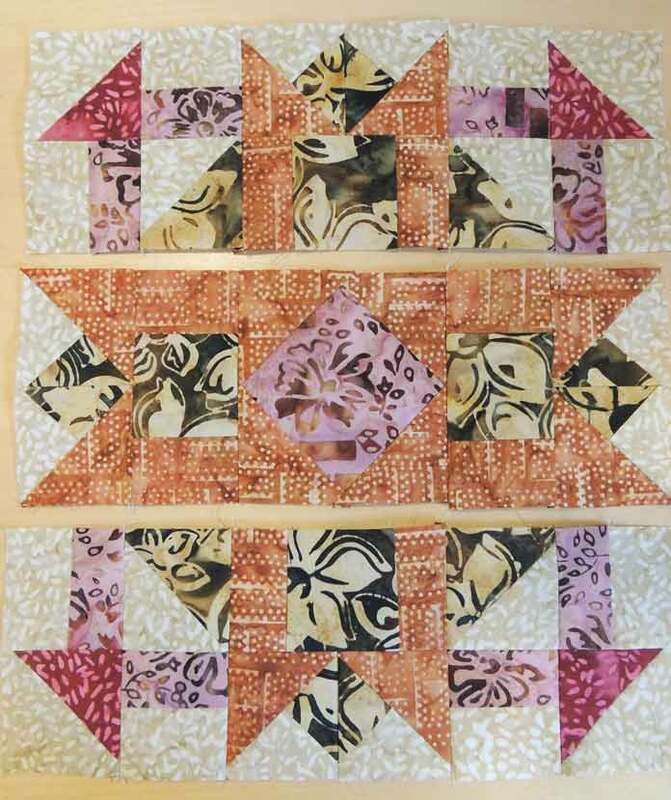 This block could be used in a sampler quilt, repeated to make a table runner or a full-sized quilt. 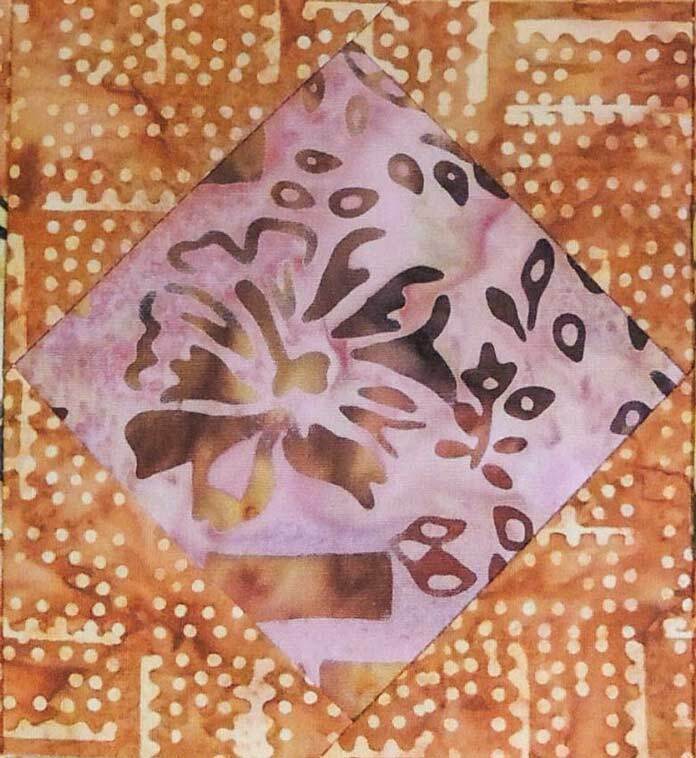 The Mary batik rust floral does a great job in the background and doesn’t even look like we cut it up! My favorite part of this design is that by using a different fabric placement the churn dashes have become a central star. Enjoy this block, but remember we’re not done yet! 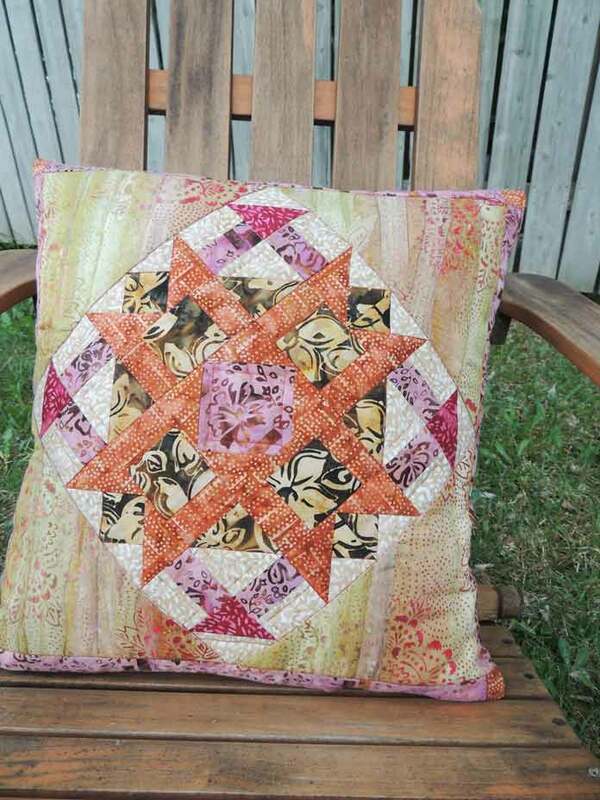 Come back tomorrow for more Mary batiks and to complete the quilted cushion cover. I drug my husband (an artist) in to a fabric store with me one day. He found the batik section. We came out with 12 yards for him and one FQ for me!! Making for charity is very rewarding. I hope you’ll add some Mary batiks to your makes! Beautiful! The instructions were so clear. Thank you. 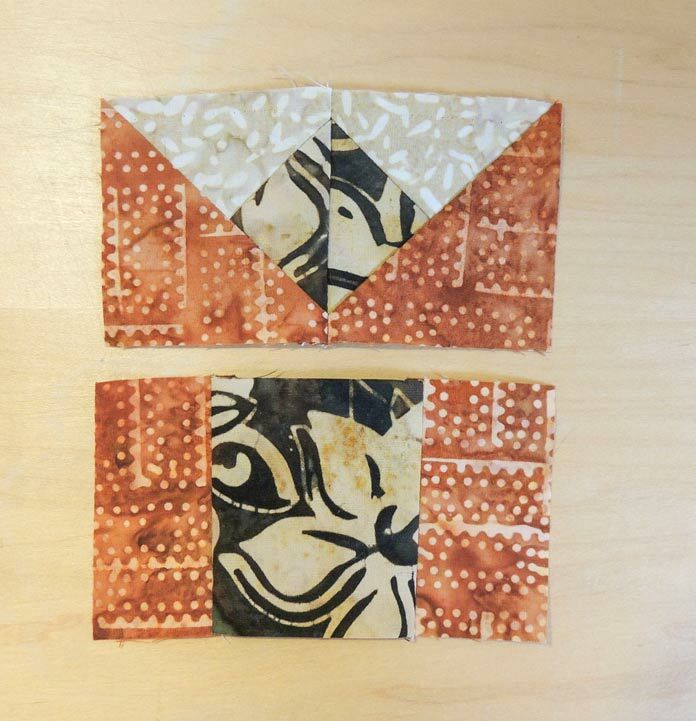 I love the batik blocks! Beautiful colors!